Beat egg and preserves in shallow dish with fork, breaking apart any large pieces of preserves. Mix Bisquick™ mix, almonds, cornmeal and salt in another shallow dish. Dip pork chops into egg mixture, then coat with Bisquick™ mixture. Heat oil in 12-inch nonstick skillet over medium-low heat. Cook pork chops in oil 15 to 18 minutes, turning once, until crust is golden brown and pork is no longer pink in centre. Sprinkle with parsley. Serve immediately. Special Touch Heat additional peach preserves until melted, and drizzle over the chops. 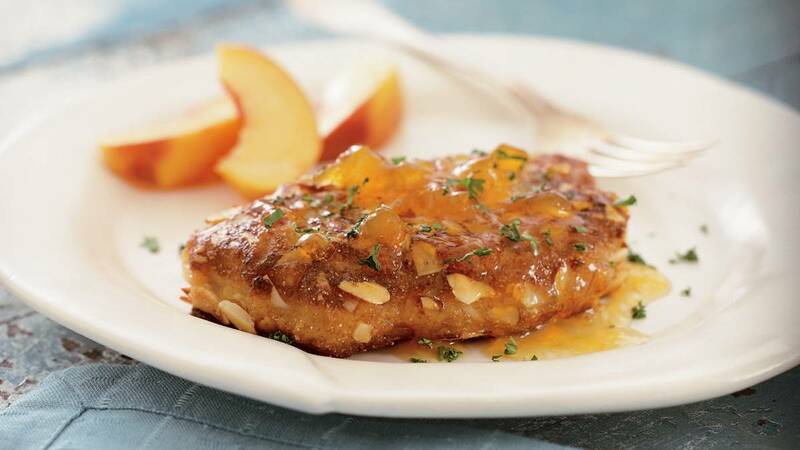 Substitution Apricot preserves can be substituted for the peach preserves.